Coming up in just a couple short weeks, Craftsbury and the US Biathlon Association are excited be offering our 4th annual Intro to Biathlon Training Camp from June 9-12. Do you have a 10-14 year old who wants to learn more about biathlon? Whether they’ve shot before or not, this is a great opportunity to learn or improve. Craftsbury is pleased to announce that Anna Schulz and Ollie Burruss will be joining the Craftsbury team as Junior and Masters’ coaches respectively. 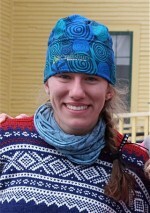 Both Anna and Ollie have a long history with Craftsbury and Nordic Skiing. Anna grew up skiing for Pepa at the Center, competing at the collegiate level for Harvard where she met Ollie. After graduation, Anna worked for a stint at the Outdoor Center before moving to Bend, Oregon where she coached at the Mt. Bachelor Sports Education Foundation. The past two years she’s been in Burlington, working on a Master’s degree in public administration at UVM, where she has also been researching how to adapt transportation infrastructure to the impacts of climate change. Along with Ollie she’s kept in touch with skiing through coaching at the Mansfield Nordic Club. The Craftsbury Green Racing Project (GRP) is now accepting applications for the 2015-16 training year. We expect to be able to add a few new members to the team. We’re excited to formally add a GRP Biathlon program in ’15-16. Applications for either the ski or biathlon program will be due by March 30 and decisions will be made by April 15 at the latest. Build a better winter this August 4-8 at Craftsbury. Craftsbury seeks to hire a Biathlon Coach to start in the late Spring/early Summer of 2014. This would be a full-time position; the coach will also be expected to participate in other projects and activities at the Craftsbury Outdoor Center as time permits. Compensation could include most meals, and a place to live.